Well, 10 years ago, on Dec. 19, 2000, NASA announced that it would conduct a competition for a PI-led mission to Pluto and the Kuiper Belt. At the time, I’d been involved in leading NASA’s science working group for just such a mission, and I had led a successful proposal to build a complete suite of science instruments for the mission. So, almost immediately upon NASA’s announcement, colleagues asked me to lead a Pluto-Kuiper Belt mission proposal. Within a week of NASA’s announcement, my team had joined up with the Johns Hopkins University Applied Physics Laboratory and formed a larger mission team, which ultimately became known as New Horizons. The 11 months that our team spent together writing and then winning that proposal, and the four subsequent whirlwind years we spent building and launching New Horizons, have become days to remember. As we enter the 2010 holiday season, with the spacecraft and instrument payload that our team built now approaching the orbit of Uranus, I can’t help but think: 10 years. Ten. Wow. 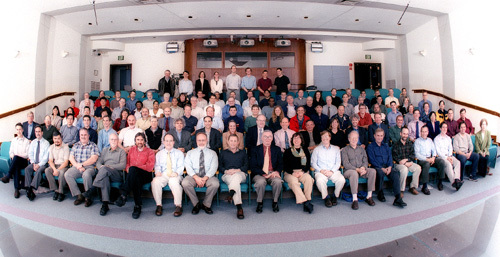 When you get involved in a project of such length — we still have more than 4 ½ years to go to get to Pluto, and another nine months after that to get all our data back on Earth — you can’t help but feel your project team is a kind of family, one you’re journeying through both space and time with. 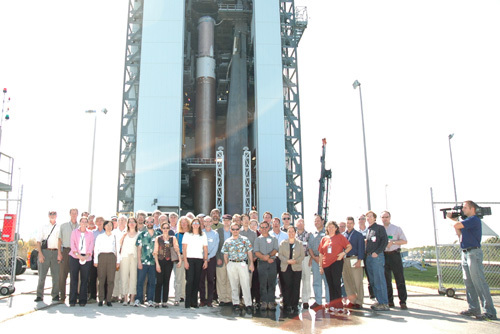 The New Horizons science team at Kennedy Space Center in November 2005, two months before launch. Kids grow up. Colleagues age. Some marry. Some divorce. Some die. Others have new children. Fashions change, as do politicians, bureaucrats and so many other things. Designs are conceived; designs are implemented. A spacecraft and rocket are built, and then launched. The craft crosses the orbits of Mars, Jupiter, Saturn and, very soon, Uranus. Still ahead is a Neptune orbit crossing in August 2014. And then — in 2015 — the first encounter with the Pluto system, six solid months of it, followed by data downlinking. Then we’ll be off, hopefully, to explore even farther from the Sun. 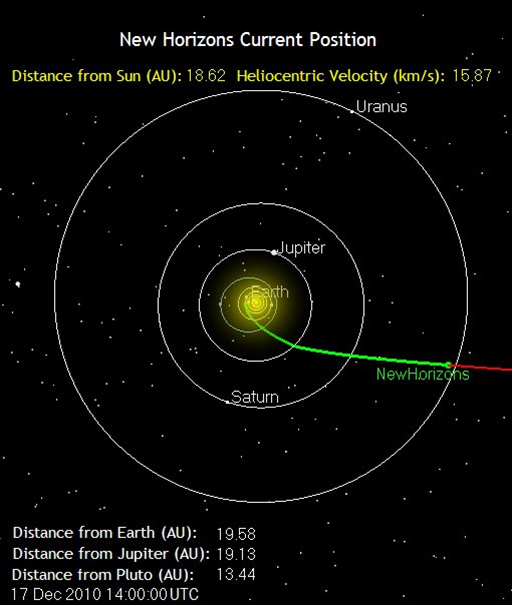 Today, our little bird New Horizons is about as far past the halfway point to Pluto that we crossed in February as the Sun is to the asteroid Ceres. With a spacecraft and instrument payload in excellent shape and on course, and a mission team that’s well practiced, I can’t help but think: We’re 10 years on in this project — and 10 years together, too. It’s amazing how far we have come. But it’s even more amazing to think about what the next years will bring. As I close out this column, I want to wish you a happy, safe, and prosperous holiday season and New Year. And I’ll leave you with a question: In December 2020 — when the data from Pluto, Charon, Nix and Hydra, and very likely a KBO or two as well, have been largely digested, when New Horizons is not 19 AU but more than 40 astronomical units from the Sun, when the project is not 10 but 20 years old, and all of us will, hopefully, have the satisfaction of having accomplished something hard and hard won — what will we be saying about these mid-mission days to remember? New Horizons is rapidly approaching the orbit of Uranus, which it will cross on March 18, 2011 � the same day the MESSENGER mission enters orbit about Mercury. Thanks again for following our journey across the ocean of space, to a truly new frontier. And keep on exploring — just as we do!